Jacob Johnson, long considered the Sinatra of Neo-Acoustic Folk/Funk, attacks his guitar like a man possessed…like a fella who’s just discovered the instrument and is hell-bent on figuring out what the dag-blasted thing can do. Jacob’s grandma taught him to play the guitar when he was a kid, but he learned to play an audience gigging at local wing joints during college. Nowadays it’s not just his guitar virtuosity that’ll stop you in your tracks, it’s his infectious joy for playing and performing that captures you, locks you in, sends you back into your life two steps happier. People fall in love at Jacob Johnson concerts. Sometimes with the artist himself and sometimes with his guitar, but mostly with who they brought to the show. You can’t spend an hour listening to Jacob play and not love the one you’re with more. Pure musical joy works that way. It infects us, seeps into our pores, makes our hearts full. If you’ve ever held hands at one of Jacob’s shows, or added “The Ferryboat Waltz” to a secret mix tape, or picked up a dusty guitar after seeing him play and searched for the chords you learned at camp that summer, then you know. 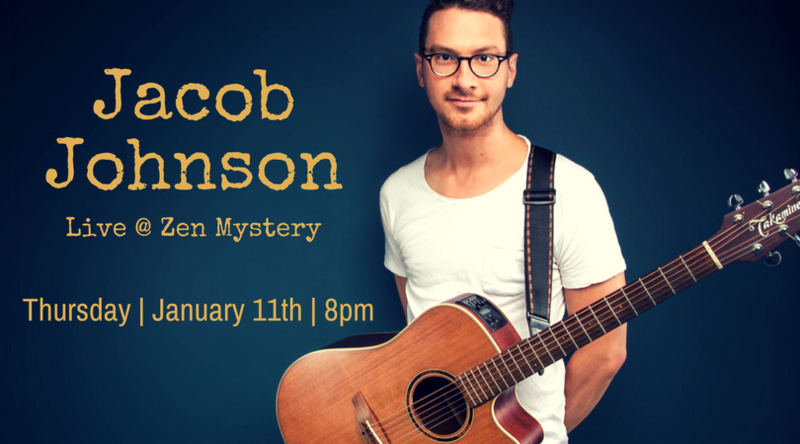 Jacob Johnson woos us all with the kind of music we fell in love with music for in the first place—infectious folk songs played with the sincere conviction that no tune can change the world, but that doesn’t have to be a bad thing.